A flourishing city that doesn't turn its back on nature - that's Edmonton. The Alberta capital is the gateway to two national parks and, and within its own city limits, boasts a huge natural area. It's also home to the world's biggest shopping centre, plus 2,000 restaurants offering 30 types of cuisine, in all price ranges. 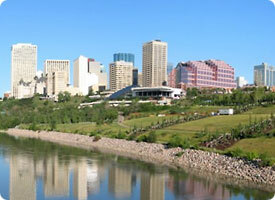 Edmonton is Canada's second most populous provincial capital and is known as a well-rounded cultural, government, and educational centre. It plays host to a year round slate of world-class festivals. Edmonton calls itself "Canada's Festival City" and lives up to the designation with theatre, art, street performers, jazz and folk music, dance and more all year round, not to mention casinos and nightclubs. Spectator sports include NHL hockey, CFL football, PCL baseball and horse racing. Included in the many festivals are: Edmonton's Capital Ex (formerly the Klondike Days Exposition), The Fringe, North America's first and largest fringe event, Edmonton International Street Performer's Festival, Edmonton Folk Music Festival, Cariwest, Canadian Finals Rodeo and many more. West Edmonton Mall not only offers 800 stores and services, it has seven indoor theme park attractions, a casino, an IMAX theatre and a day spa. Old Strathcona Historic Area is another must-visit for dedicated shoppers, who could spend a day browsing Whyte Avenue's antique and gift shops, and having a leisurely lunch at a cafe. Edmonton has numerous distinct neighbourhoods. Within in the downtown core are numerous inner city neighbourhoods such as Glenora, Westmount, Queen Mary Park, Central McDougall and McCauley on the north side of the river, while Windsor Park, Garneau, Strathcona, Bonnie Doon, and Strathearn line the south side of the river. Several communities survived attempts by the municipal governments of the 1970s to rid the valley proper of all residents: these are Riverdale, Rossdale, Walterdale, and Cloverdale. As with any city of its size, the inner communities give way to a collection of suburbs, generally classified as being outside the inner ring road and in extreme cases, outside of Anthony Henday Drive. The most well known of these is Mill Woods, which is home to approximately 100,000 residents. If Mill Woods were a separate municipality, it would be Alberta's third largest city after Calgary and Edmonton. Several new neighbourhoods are currently in formative stages in the South and Southwest, such as MacEwan, Terwillegar, and Rutherford. Remember, Alberta has no provincial sales tax and most shops are open daily, including Sunday afternoons and many holidays.